Syringe eliminates parallax errors by providing a digital readout on its integrated LCD screen. An adjustable plunger-stop guarantees reproducible plunger placement. Read the syringe volume directly from the liquid crystal display. The digital display eliminates volume reading errors as well as ensures that everyone in the lab reads the syringe volume the same. Every Digital Syringe is a calibrated device traceable to N.I.S.T. methods. 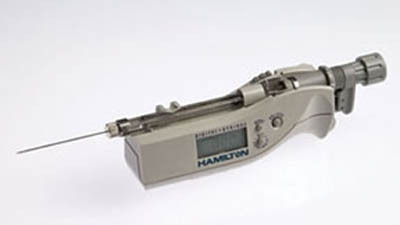 Use it to calibrate analytical instruments (AA/ICP, GC, HPLC, etc. ), prepare standards and spike samples. Provides easier to compliance with EPA, CLIA, ISO and FDA (GLP, GMP) requirements. The 700 and 1700 series MICROLITER™ and GASTIGHT™ Digital Syringes are certified to ± 0.5% accuracy or better. Improved precision is easily achieved with the built-in adjustable plunger stop. The adjustable plunger stop (0-100% of syringe volume) is engaged with a touch of the button on the back of the digital syringe.